Its my turn to share with you on Shes A Sassy Lady. Thank you for having me Shelia. I found this site by Mathew Bohan and his sketches are so beautiful. I printed the image onto neenah cs then water colored this cardinal and I am very pleased with the results. The card base is recollections black. The DSP is from making memories. The background was made using pan pastels. 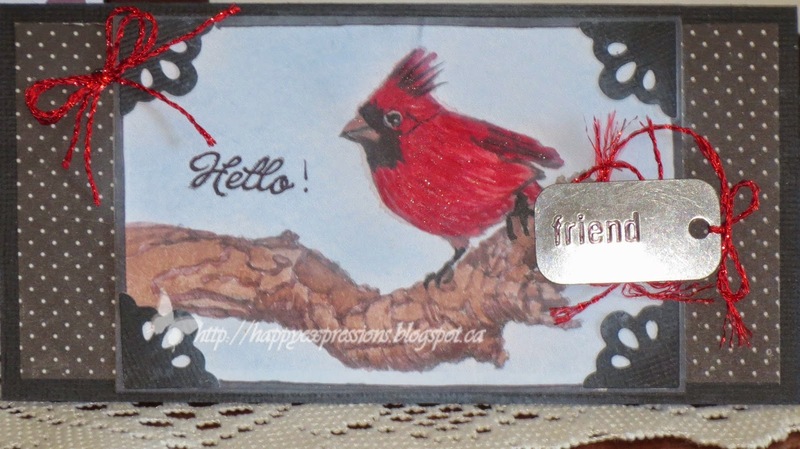 The small corner are from a kwik kuts die using the left overs from the base of the card.I have a box of the tags with different says so I used the friend and added some red thread under the tag. To finish the card I added a bow with the same thread. I wrote the sentiment on the image using a copic black multiliner, but wasn't careful enough and didn't get it straight. I hope you have feel inspired to create something new. Thank you for stopping by, happy crafting and have a fabulous day!